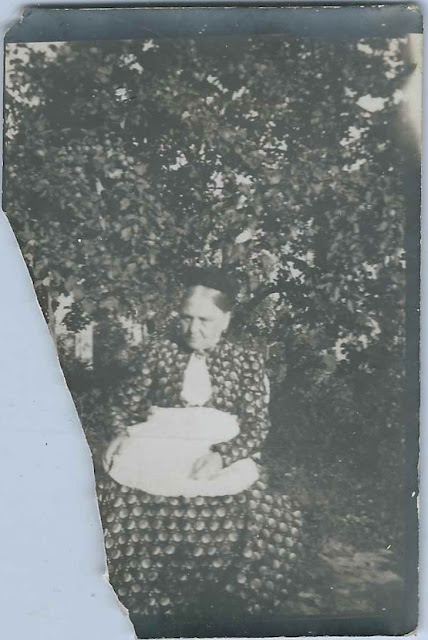 1911 snapshot of "Grandma Hansen, Dec. 12, 1911. Picture taken on her birthday July 27, 1911, at Eidsvold". Whether Eidsvold is the town in Minnesota or North Dakota, or perhaps Eidsvoll in Norway, I don't know, but I suspect the photograph is from the United States. As you can see, there's a piece missing along the left side. 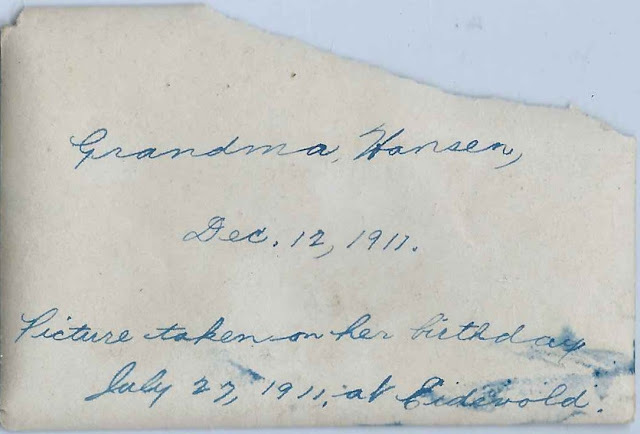 Among several possibilities, Grandma Hansen may have been Kari Olsdatter (Moen) Hanson, wife of Rasmus Hanson, who were living at at Eidsvold, Minnesota at the time of the 1910 Federal Census. According to the 1900 Census of Westerheim, Minnesota, Kari (also Carrie, Carey, etc. on record) was born about July 1840 in Norway. She November 24, 1916 in Lyon County, Minnesota, according to a Minnesota death record. Kari's Find-a-Grave memorial gives her married name as Hanson and provides two birth dates for her, neither of which is July 27. The text shows June 29, 1840, but her stone clearly shows June 4, 1840. These dates may eliminate Kari from consideration as the woman in the photograph. Kari's husband, Rasmus Hanson, was born at Oppland Fylke, Norway on April 4, 1835. Information they provided to the enumerator in the 1900 Census indicates that they immigrated to the United States in 1868, about 32 years before and had been married for 32 years. Whether they knew each other in Norway and married there just before immigrating, or married in the United States, I don't know. I believe Kari and Rasmus had at least nine children, though I don't know if they all survived to adulthood. If you feel that Grandma Hansen was another person or if you have corrections and/or additions to the information above, please leave a comment or contact me directly.